Krispy Kreme Holiday Donuts are Here! We snacked on this today. After lunch. Soon after guzzling a 500mL PET bottle of Mountain Dew. Mind you, I’m not a heavy soda drinker. New realization. Too much sugar takes you straight to a sugar crash. Or maybe it’s just because I have a caffeine-laden bloodstream. Either that or I really just wanted to nap. Grab the Krispy Kreme Holiday Donuts. 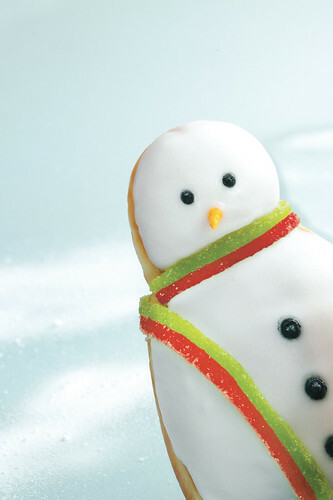 Three variants are out, a vanilla-frosted gift-shaped square donut, a candy sprinkled ring donut, and an adorable Snowman-shaped frosted doughnut, replete with sour gummy tape scarf. I think they’ll be a very welcome gift, especially if you get them packed in their gift tins. I know I loved receiving mine. Frosty the Donut. Too late, he realized his calling in life. Thank you Krispy Kremes! Omnomnomnomnomnomnom! 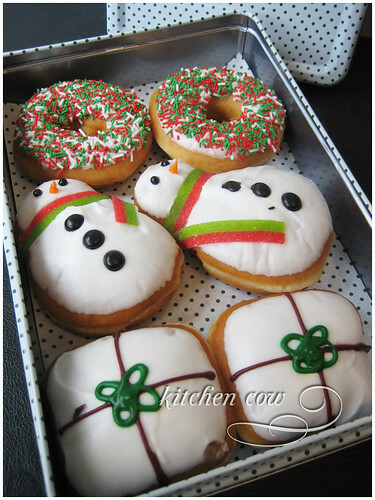 6 Responses to Krispy Kreme Holiday Donuts are Here! Must have that snowman again…I missed him so much! Killer combo! I’ll just go with plain coffee. Can’t manage a minty hot choco with it, even if it sounds divine. frosty is too cute! I don’t think I would wanna eat him hahaha! He’s meant to be nomnommed!! !